Nigerian High Commissioner to Gambia rallies support for SIFAX Group. Ambassador OluwasegunIbidapo-Obe, the Nigerian High-Commissioner to The Gambia, has commended SIFAX Group for its planned multi-million dollar investment plan in The Gambia. The company recently signed an agreement with the government of The Gambia to build an inland container depot (ICD), which will help in decongesting the Port of Banjul and bring a more efficient system into the country’s port operations. 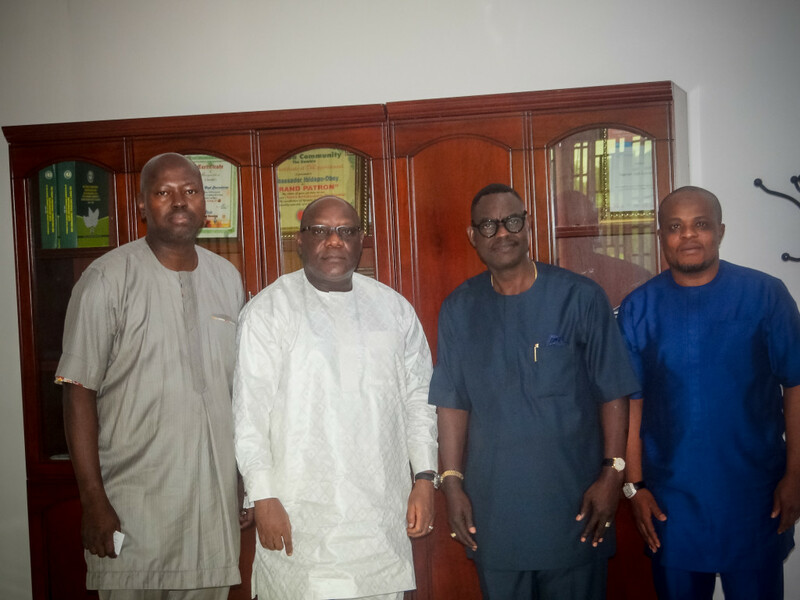 The commendation was made recently during a courtesy visit of the SIFAX Group officials led by Dr. Taiwo Afolabi (MON), Group Executive Vice Chairman, SIFAX Group to the Nigerian High Commission in the Gambia. 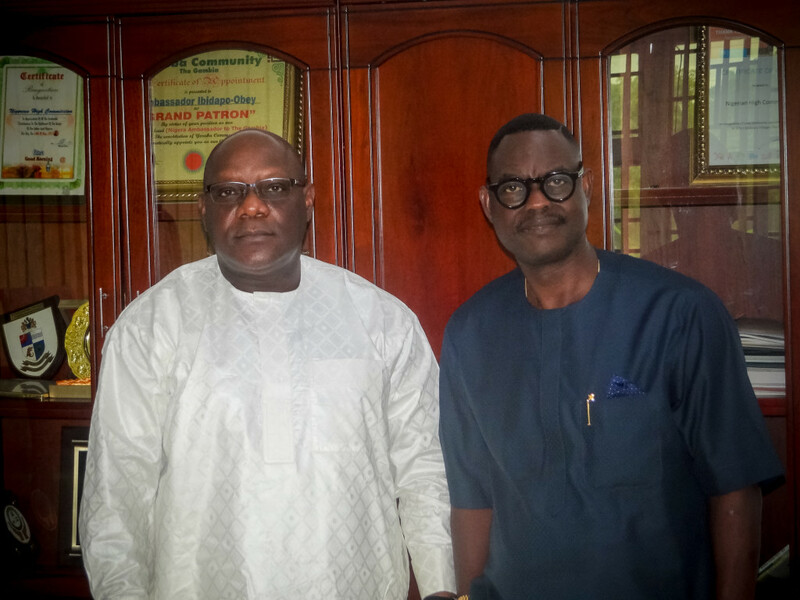 L-R – Ambassador Oluwasegun Ibidapo-Obe, Nigerian High Commissioner to The Gambia and Dr. Taiwo Afolabi, Group Executive Vice Chairman, SIFAX Group during a courtesy visit by the SIFAX Group team on the High Commissioner in Banjul, Gambia recently. The High Commissioner assured SIFAX Group of the Commission’s support in making the new business venture a success, stating that he and his team are already mobilizing patronage in readiness for the business take off, which is billed for next year. Ibidapo-Obe further noted that he was thrilled that SIFAX Group would be establishing a multi-million dollar business in the country, adding that such would aid economic integration of the sub-region. He said: “It’s so heartwarming to hear that a Nigerian company is making waves in the international business circle. I am even happier that this project is happening during my tenure as the High Commissioner to The Gambia. I want to commend the SIFAX Group team led by Dr. Taiwo Afolabi (MON), Group Executive Vice Chairman, SIFAX Group that they have done well by investing in this country filled with so many opportunities. I also want to assure you that the High Commission will be very willing to assist in making this business enterprise thrive greatly and also make the SIFAX Group brand a household name in the Gambia”. L-R – Adeyemi Odusanya, Executive Director, Corporate Banking & South Directorate, Keystone Bank; Ambassador Oluwasegun Ibidapo-Obe, Nigerian High Commissioner to The Gambia; Dr. Taiwo Afolabi (MON), Group Executive Vice Chairman, SIFAX Group and Saheed Lasisi, General Manager, Business Development and Strategy, SIFAX Group during a courtesy visit by the SIFAX Group team on the High commissioner in Banjul, Gambia recently. Dr. Taiwo Afolabi, while thanking the High Commissioner for his kind words, assured that the company will fulfill the expectations and the confidence of the government and people of the country. “I want to thank you for your warm reception and promised support. I assure you that we will transform the Gambian economy with our business investments. SIFAX Group is synonymous with excellent and innovative service delivery and we will not renege on that”, he said. In a related development, SIFAX Group has taken possession of the land on which it plans to build the inland container depot in Banjul, Gambia. Contractors and equipment have also been mobilized to site on the project which is projected for completion by the first quarter of 2019.